Most surveillance cameras don't even look like that anymore. We don't know what they look like because they are manufactured ever-smaller and are increasingly hidden - even hidden in plain sight (Hint, hint; Your webcam or cell phone cam). In 2012, the L.A. Sheriff's Dept. deployed surveillance aircraft to spy on Compton residents. 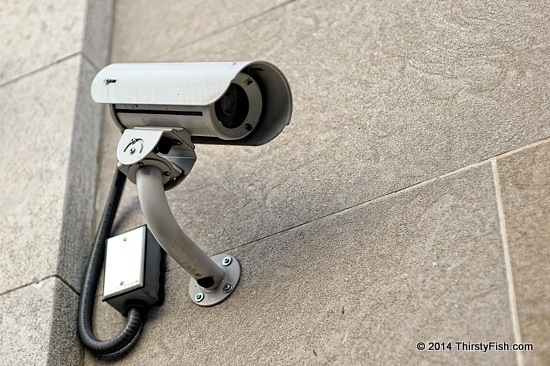 Mass surveillance is becoming commonplace in local law enforcement. Mass surveillance means more people could be targeted and more who may have committed victimless crimes will end up in prisons. Can you imagine ending up in prison for being a Good Samaritan? Surveillance, together with intrusive laws and ordinances makes that a reality. Many cities have or are attempting to outlaw feeding the homeless. Many have outlawed lemonade and cookie stands. So, even a kid handing a homeless person a glass of lemonade is a "crime" captured on a surveillance camera!